Such is Great Britain’s cycling success, that any race involving a British cyclist now carries the expectation of a victory. So it came as a major disappointment to many that no British rider made it to the finish line of the elite men’s road race at the World Championships on Sunday, let alone earn the right to wear the stripy jumper. When the GB line-up for the men’s road race was revealed by British Cycling, that pre-race expectation had solid foundations: two Tour de France winners, Olympic champions, British champions, Grand Tour stage winners… it was, without doubt, the most successful collection of riders ever fielded by Britain. But the World Championship is not a predictable race. The long 272km route and climb-filled circuit around Florence was designed to whittle down the field so that only the best survived – a course worthy of defining a world champion. The task set in the hands of the riders was made even more difficult by torrential rain and slick roads. Road racing is a unique sport in that a team works for an individual winner. You could fairly argue that any nation that finishes a World Championship with its entire team intact probably hasn’t worked hard enough. For those countries lucky enough to gain six or more places for the Worlds – the maximum was nine – then they are going to pick team workers as well as potential winner. Those workers will do their job and peel off. Froome was the nominated leader, although he only ranked himself as an outside bet for the win. The climbs were too short and too frequent for the wiry 2013 Tour winner to make his mark, favouring a more punchy rider with an explosive attacking style. Why, then, did we see the team of an outsider take to the front of the peloton for much of its journey from the start in Lucca to the start of ten laps of the finishing circuit? Mark Cavendish and Luke Rowe guided the race for much of the opening 100km before the first of those ten circuits and it looked like Britain was setting its stall out for something big. We’re Britain, the best cycling nation in the world, and we’re taking control. It looked convincing and expectation grew. Cavendish, his work done, and Bradley Wiggins (pictured right) were the first to drop out. Time trial silver medallist Wiggins had said before the race that he was there to support Froome, but was barely visible. 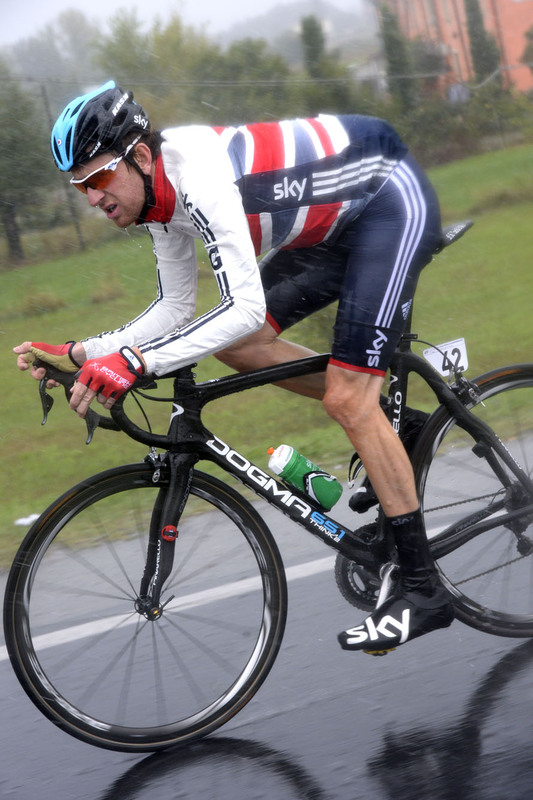 Wiggins had temporarily conquered his fear of slippery roads during a wet Tour of Britain where he was willing to ‘put himself in hospital’ to take the victory during the race’s time trial stage, en route to taking the overall win. But here he just looked uncomfortable, as he did during his ill-fated stab at the Giro d’Italia in May. Rowe also withdrew – no surprise given the last-minute call up to replace Jonathan Tiernan-Locke. Then Steve Cummings was ruled out by a puncture as Geraint Thomas and Ian Stannard – usually the most reliable of workers – lost touch with the front group on the stream of climbs. Twenty-one-year-old Josh Edmondson had been the rider who’d stuck closely to Froome, but he was caught up in a crash that also wiped out Australian hope Cadel Evans. Froome was isolated, without team-mates and dropped from the front group. Still with around 100km to go he pulled out, convinced that he would not be able to contest the win. What made it worse for the viewing public was that all British riders were out of the race just as it went live on mainstream television. Anyone tuning in to watch Tour de France winners Chris Froome and Sir Bradley Wiggins strutting their stuff was instead faced with an explanation by BBC commentator Simon Brotherton that there weren’t any Brits left to watch. You could almost feel the BBC producer’s finger poised over the button to switch to a repeat of Homes Under The Hammer. It was a far cry from the 2011 road race that Britain controlled from beginning to end, putting Cavendish into the rainbow jersey. But that race in Copenhagen had been ear-marked by British Cycling several years beforehand, with meticulous planning and perfect execution. An in-form Cav was a dead cert for that route, something which was proven. Froome didn’t have that luxury going into this year’s race. He wasn’t really expected to win, and he didn’t. Us British like to see a plucky trier, and for the entire team – the best team we’ve ever had – to pull out en masse really got people’s backs up. The abuse via social media was as torrential as the downpour in Tuscany that morning. How could the Brits of all people fade in the rain? How could Froome not keep up with the very riders he beat in the Tour de France? Where was the desire, the drive to win? And can Bradley Wiggins hand back his knighthood? Really, several people actually suggested that. Britain’s most successful cyclist in history should have his Sir removed for dropping out of a race. Some had suggested the same when he ‘lost’ the time trial to Tony Martin the previous week. It’s true, it was a less than great performance all round. But this failure has led, momentarily at least, to an element of fans to forget all that has gone before it. The success of the current crop of British cyclists has hit such highs that something that was once a uniformly regular occurrence – no chance of a British victory – is now seen as a monumental disaster.